Gerd's Frame of Mind label aims to reissue classic older tracks as well as fresh new house sounds. Here are seven exquisite deep house cuts for you by producer Toyin Agbetu. A forgotten hero of the UK underground responsible for some of the most exquisite music out there. Between 1990 - 1992 this veteran producer made everything from street soul and hip-hop to moody Chicago and Detroit inspired house and soulful garage cuts. All crafted with passion, love and devotion. 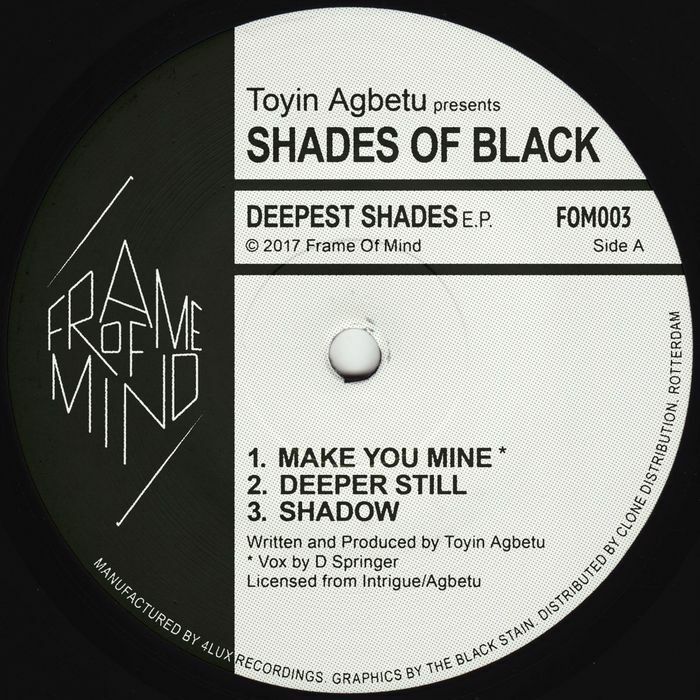 With this EP Frame Of Mind introduces you to some of his finest works recorded under the Shades Of Black alias, where Gerd has selected several out of print releases from the Intrique label. A must have for fans of classic house such as Larry Heard. Since quitting the music business, Agbetu is these days a writer, educator, artist-activist and Pan African community worker.